1. Neither moral nor immoral: Ervin is considered an amoral man who is pursuing his own personal goals. 2. Not concerned with honest or good behavior: As the CEO of the company, Diana was accused of working in a cynical and amoral way of competing for more sales and greater profits. 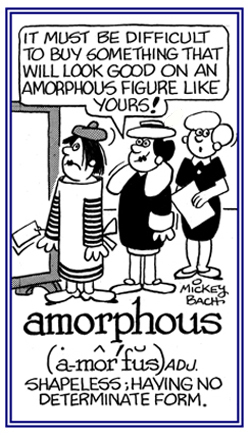 Without a clear shape or form: An amorph lacks a discernible form and so it can be described as having an irregular or an undefined shape or structure. The sculptor took a lump of clay that was an amorph and molded it quickly into a rough human form. The lawyer did not present any reasonable arguments in defense of his client, Mary Jones; instead, he presented a collection of unsupported amorphs that persuaded no one to acquit her of the charges. 1. Lacking the ability to recognize the size and shape of objects: Winston's amorphagnosia made it impossible for him to have the skills to understand what anyone meant when he was told to pick up his Teddy Bear or any of the other toys that were available for his use. 2. 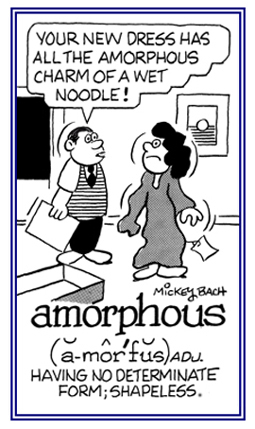 Etymology: from the Greek prefix a, "without, not" + Greek morphe, "shape" + Greek gnosis, "knowledge". 1. Having no definite form; shapeless, formless: Lying on his back in the grassy field, Brendan could watch the amorphous clouds float overhead. 2. Not belonging to a particular type or pattern: Toby's amorphous commitment to regularly paid employment was difficult to understand. 3. Of no particular kind or character; indeterminate; having no pattern or structure; unorganized: Kari has an amorphous style of writing; as well as, an amorphous personality. 4. In petrology, a mineral occurring in a mass, as without stratification, form, or crystalline structure: The amorphous layer of sand was mixed with an unidentified hard substance which made drilling for natural gas difficult. © ALL rights are reserved. Without life or animation; dejected, as if dead; utterly cast down: Mable could see that Bert had amort feelings which were indicated by the slump of his shoulders and his attitude. 1. Musical inability, whether for perception, production, or reproduction of vocal or instrumental sounds: From an educational perspective, knowledge of every aspect of congenital amusia should enrich the current view of other forms of learning disabilities; such as, dysphasia and dyslexia. 2. Music deafness or the inability of a person to produce or to appreciate musical sounds: The continued efforts in understanding the causes of congenital amusia should shed light on the question as to whether or not music processing corresponds to a genuine specialization of the brain. 3. An inability to recognize the significance of sounds, manifested as a loss of the ability to recognize or to produce music: Amusias show a particular deficit in discriminating musical pitch variations and in recognizing familiar melodies. 4. A condition in which there is the loss of a musical ability: It was tragic that the composer suffered amusia and was unable to continue to compose his own music or even to read the musical scores of other composers. 5. Etymology: from Greek amousia, then through New Latin, "being without the Muses"; especially, with singing. Absence of muscle sensations: Darin's amyoesthesia resulted in his not being able to sense motions, weights, or balances. The lack, or loss, of muscular sense or perception: Muriel's amyoesthesis made it impossible for her to be aware of movements or even of different positions. Deficient formation of muscle tissue and a lack of muscle growth: As a result of significant malnutrition, Irvin had a form of acquired amyoplasia in his muscle tissues. Generalized absence of muscle tone; a floppiness of the muscles: Amyotonias are usually associated with flabby muscles and an increased range of passive movements at the joints. Lacking in muscle size and number of muscle fibers that takes place with aging, reduction in blood supply, or following physical inactivity, and malnutrition: The amyotrophia that anyone has is often a progressive deficiency of muscle tissue; especially, because that person doesn't move around and use his or her muscles. There are numerous causes for the amyotrophias of muscles; including, chronic malnutrition, immobilizations, and denervation which is a loss of nerve supplies that may be caused by a disease; for example, in polio where the death of motor neurons causes the denervation of muscle fibers. Lacking muscular tissue or without muscular strength: The amyous physical condition of many elderly people in nursing homes is believed to be a result of too much sitting around and not nearly enough physical exercise. The absence of the normal secretion or flow of mucus: A person with amyxorrhea is missing the protective secretions of mucus membranes; such as, the mucus membrane secretions in the digestive tract where it is needed to lubricate the passages of food. Amyxorrhea in the nose and throat and lungs will make it much easier for bacteria to penetrate the body through the epithelium or the membranous tissue that covers those bodily parts plus the other internal organs and internal surfaces of the body. Without a normal sour corrosive solution containing hydrogen ions: Dr. Swift told Bert that his antacid condition was a result of the absence of normal hydrochloric acid in the gastric juice of his stomach mucosa. Showing page 9 out of 23 pages of 340 main-word entries or main-word-entry groups.